— This article by Jerry Cates was first published on 23 October 2015, and revised last on 12 September 2016. © Budsinthenews Vol. 6:10(2). The spice we know as cinnamon is obtained from the inner bark of several trees from the genus Cinnamomum. One of these trees, of the species Cinnamomum verum, is commonly known as Ceylon Cinnamon (often with the taxonomical designation Cinnamomum zeylonica), and is generally considered to be the “true cinnamon,” to the point that in many nations it is unlawful for merchants to label the spice from any other species as cinnamon. Instead, in many cases they must call the spice Cassia, a reference to Cinnamomum cassia, sometimes known as Chinese cinnamon, a species of Cinnamomum often substituted for C. verum. Note: Of the four species commonly marketed as cinnamon in the U.S., only two are used in preparations manufactured by EntomoBiotics Inc. for use as cleansers and habitat modifiers. Though this article provides general information on all four species, we also explain here the reasons for our use of only two of them, and our decision to exclude the others. 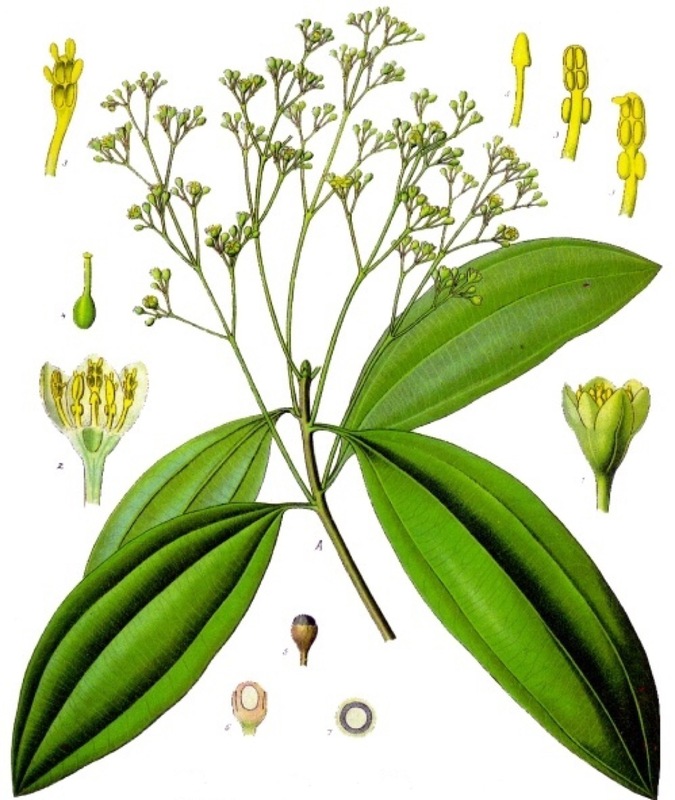 A third species, Cinnamomum burmannii, also known as Indonesian cinnamon, Padang cassia, Batavia cassia, or korintje, is another plant in the genus Cinnamomum whose bark is often sold in the U.S. as cinnamon. Cinnamomum burmannii contains little or no eugenol, but contains higher amounts of coumarin than cassia and Ceylon cinnamon. 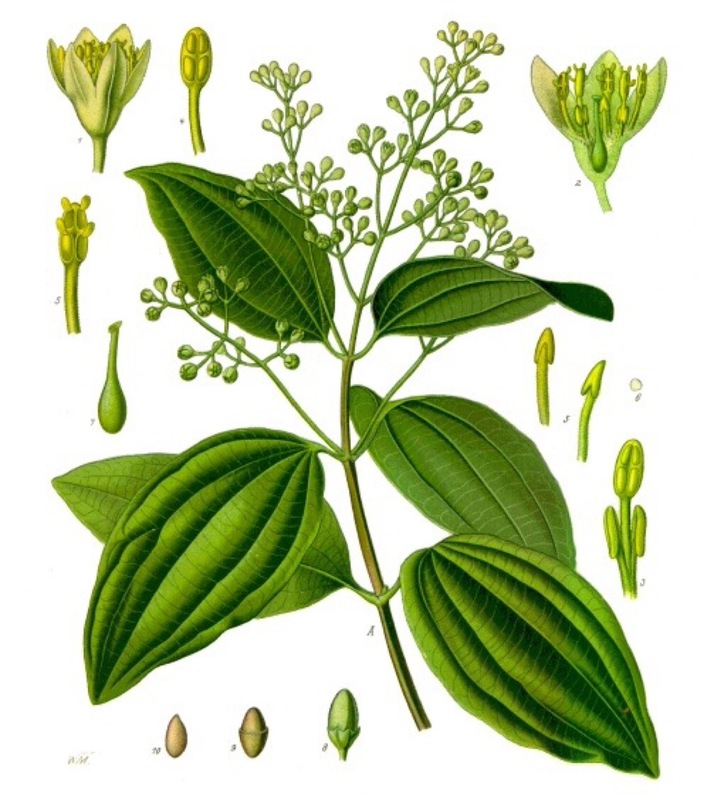 A fourth species, Cinnamomum loureiroi, which is also known as Saigon or Vietnamese Cinnamon, has characteristics similar to Cassia and Indonesian Cinnamon, in that its bark contains little eugenol but high fractions of cinnamaldehyde and coumarin; in fact, of the four species described here, C. loureiroi contains by far the highest fraction of coumarin. Due to the high cost of true cinnamon, most of the cinnamon-related spice in international commerce is derived from the various related species. In the U.S., spice derived from any species of Cinnamomum may be labeled as cinnamon, and there is no requirement by U.S. authorities for retailers to identify the species of Cinnamomum from which the spice is derived. Coumarin (2H-chromen-2-one), C9H6O2, is a fragrant organic chemical compound in the benzopyrone chemical class, and in its standard state is a colorless crystalline. It is a natural substance found in many plants. Coumarin is a phytochemical which has demonstrated hepatotoxic and carcinogenic properties in animal-based studies. Based on this the European Food Safety Authority established a tolerable daily intake (TDI) for coumarin of 0.1 mg/kg body weight. Some objected to that, basing their objections partly on the fact that, at the time, no human-based studies had been conducted to determine if the animal-based hepatotoxicity of coumarin was reflected in human biology. The common name for this chemical is derived from a French term for the tonka bean, coumarou, which is one of the sources from which coumarin was first isolated, in 1820, as a natural product. It has the sweet odor of new-mown hay, and since 1882 has been used in perfumes. Sweet woodruff, Meadowsweet, sweet grass and sweet-clover in particular are named for their pleasantly sweet smell, which is a consequence of their high coumarin content. In forage plants, coumarin is often produced in large quantities and imbues the leaf with a somewhat bitter taste. Animals that consume such forage experience appetite suppression as a direct result. This has led to the presumption that coumarin is produced by plants as a defense against predation. Besides being used in certain perfumes and fabric conditioners, coumarin has been used in the past as an aroma enhancer in pipe tobaccos and certain alcoholic drinks. Today, however, it is generally banned as a flavorant food additive, due to concerns mentioned earlier regarding its hepatotoxicity in animal models. 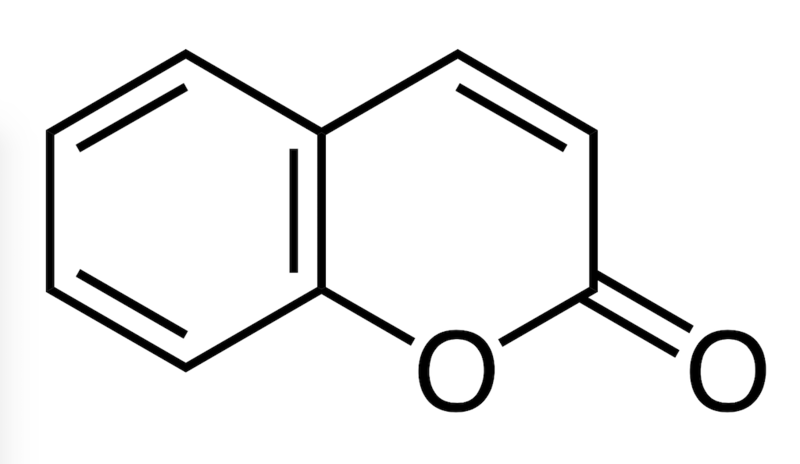 Coumarin was first synthesized in 1868. It is used in the pharmaceutical industry as a precursor reagent in the synthesis of a number of synthetic anticoagulant pharmaceuticals similar to dicoumarol, the notable ones being warfarin, which is marketed under the brand name Coumadin, and some even more potent rodenticides that work by the same anticoagulant mechanism. So-called “coumarins” (modified coumarins) are a type of vitamin K antagonist. Pharmaceutical, i.e., modified, coumarins were all developed from the study of sweet clover disease (an affliction of ruminants fed large amounts of spoiled sweet clover silage, in which the coumarin has been converted, via fermentation, to the toxin dicumarol). However, unmodified coumarin itself, as it occurs in plants, has no effect on the vitamin K coagulation system, or on the action of warfarin-type drugs. Coumarin has clinical medical value by itself, as an edema modifier. Coumarin and other benzopyrones, such as 5,6-benzopyrone, 1,2-benzopyrone, diosmin, and others, are known to stimulate macrophages to degrade extracellular albumin, allowing faster resorption of edematous fluids. Other biological activities that may lead to other medical uses are under investigation. So, coumarin has a complex and interesting effect on animals and humans, some of which are beneficial, while others have been shown to have unfavorable results. With regard to hepatotoxicity in human biology, clinical data has been mixed. Some humans treated with coumarin medicinally are able to metabolize the chemical readily, with little susceptibility to hepatotoxicity, but as studies progressed it was revealed that a subgroup of the human population is even more susceptible to the hepatotoxic effect than the animal species previously investigated. Using that human data, a TDI of 0.1 mg/kg body weight — for that human subgroup — was again derived, confirming that of the European Food Safety Authority. Nutritional exposure, mainly due to use of cassia cinnamon in cookies and other sweet, spiced dishes, indicates that consumers of cassia cinnamon are at risk of reaching a daily coumarin intake corresponding to the TDI. Let’s see if we can make some sense of this. A 100 lb. person weighs 45.36kg. Thus the TDI for coumarin for a 100 lb. person would be 4.54mg (0.00454g)/day. For that person, a kilogram of C. verum contains 3.75 TDIs of coumarin; a kg of C. cassia, by comparison, contains 68 TDIs, and a kg of C. loureiroi contains 1,535 TDIs. To reach the TDI upper limit by consuming C. verum, a 100 lb. person would need to consume 266 grams over a 24 hour period. With C. cassia, the TDI is reached on consuming 14.7 grams, but with C. loureiroi, a mere 650mg is enough. Keep in mind that, for a 50 lb. child, these figures are halved (C. verum: 133g; C. cassia: 7.35g; C. loureiroi: 325mg), while with a 200 lb. person they are doubled (C. verum: 532g; C. cassia: 29.4g; C. loureiroi: 1.3g). A level baking teaspoon of raw, ground C. verum weighs about 2.6 g. Obviously, it would be difficult, if not practically impossible, to reach the TDI for coumarin by consuming raw C. verum, as one would have to consume 100 level teaspoons in a 24 hour period. It would be easier with raw C. Cassia, as only 6 level teaspoons is required. With raw C. loureiroi, half a level teaspoon is enough, so the likelihood of reaching the TDI for coumarin is very high, especially with any dish that is well seasoned with Vietnamese cinnamon. Phở, a much loved Vietnamese noodle soup, is sometimes seasoned with Vietnamese cinnamon, but only in the broth. In light of the above, many authorities believe it is reasonable to recommend that humans limit their intake of cinnamon derived from any source other than C. verum. In the U.S., however, very little of the cinnamon on our grocery shelves is derived from that source. While on this subject, one more note should be made. Cinnamon is reported to have important, beneficial effects on human blood glucose levels. These effects are of particular value to diabetics. It has become somewhat vogue of late, in some diabetic circles, to consume cinnamon in capsule form as a means of reducing the amount of insulin needed to maintain blood glucose at proper levels. The author has noted that much of the cinnamon sold in capsular form for this purpose is C. cassia, if it is even identified on the label (often the label for on-the-shelf cinnamon capsules sold in grocery and health-food stores say nothing about the species of Cinnamomum the capsules contain). Taking cinnamon capsules for health may be a good idea. But — to be safe — one should probably only consume C. verum in this way. Chances of exceeding the TDI for coumarin, by consuming cinnamon from C. cassia, in much greater when taking cinnamon capsules. For example, using capsules containing 500mg of cinnamon, a 100 lb. person would only exceed the TDI for coumarin with C. verum by ingesting 533 capsules a day, but with C. cassia, the TDI would be exceeded by ingesting only 30 capsules (e.g., by taking 10 capsules 3 times a day, which is a pretty high dosage, yet not outside the realm of possibility for some determined individuals). With C. loureiroi, ingesting only 3 of the 500mg capsules would exceed the TDI. When the author purchases C. verum, it is ordered in squib, or stick, rather than in powdered form, to enable verification first hand that the product is, in fact, C. verum. The squibs or sticks are then cold-ground in a spice grinder (sticks of C. verum are soft enough to crumble in the palm of one’s hand, and are easily reduced to a fine powder, while those of all other species of Cinnamomum are hard enough to require special grinders to pulverize them). Then, to consume the cinnamon in capsule form, he makes his own capsules. That, by the way, is something anyone can do. Small, easy-to-use encapsulation kits are available on the Internet that enable anyone to make their own capsules. The kits come in different sizes, enabling one to make small capsules or very large ones. Cinnamaldehyde, an organic compound with the formula C6H5CH=CHCHO, occurs as both cis- and trans isomers. It is from this molecule that cinnamon derives its flavor and odor. Cinnamaldehyde is a natural flavonoid that is naturally synthesized by the shikimate pathway. The shikimate, or shikimic acid pathway, is the accepted name for a seven step metabolic route used by bacteria, fungi, algae, parasites and plants to biosynthesize the aromatic amino acids phenylalanine, tyrosine, and tryptophan. Since this pathway is not found in animals, the products of this pathway represent essential amino acids that must be obtained from plants that the animals consume. The pale yellow, viscous liquid known as cinnamaldehyde is a constituent of the bark of cinnamon trees and other species of the genus Cinnamomum. The essential oil of cinnamon bark is, as a rule, about 98% cinnamaldehyde. Dumas and Péligot isolated cinnamaldehyde from cinnamon essential oil in 1834. Twenty years later the Italian chemist Luigi Chiozza synthesized cinnamaldehyde in the laboratory. The trans-cinnamaldehyde molecule is found in nature, has the form of a benzene ring attached to an unsaturated aldehyde, and can be viewed as a derivative of acrolein (systematic name: propenal, the simplest unsaturated aldehyde, a colourless liquid with a piercing, disagreeable, acrid smell of burnt fat). The biosynthesis of cinnamaldehyde begins with deamination of L-phenylalalanine into cinnamic acid by the action of phenylalanine ammonia lyase (PAL). PAL catalyzes this reaction by a non-oxidative deamination. This deamination relies on the MIO prosthetic group of PAL. PAL gives rise to trans-cinnamic acid. In the second step, 4-coumarate: CoA ligase (4CL) converts cinnamic acid to cinnamoyl-CoA by an acid-thiol ligation. 4CL uses ATP to catalyze the formation of cinnamoyl-CoA. 4CL effects this reaction in two steps. 4CL forms a hydroxycinnamate-AMP anhydride, followed by a nucleophile attack on the carbonyl of the acyl adenylate. Cinnamoyl-CoA is reduced by NADPH catalyzed by CCR (cinnamoyl-CoA reductase) to form cinnamaldehyde. Common uses for cinnamaldehyde include flavoring in chewing gum, ice cream, candy, and beverages. It is also used in perfumes to impart natural, sweet, or fruity scents. Almond, apricot, butterscotch, and other aromas may partially employ the compound for their pleasant smells. It is also used as a fungicide, and has been proven effective on over 40 different crops when applied to the root systems of plants. Its low toxicity and well-known properties make it ideal for agriculture. An effective insecticide, its scent is also an effective animal repellant, including cats and dogs. It has been proved to be a safe and effective insecticide against mosquito larvae (a concentration as low as 29 ppm of cinnamaldehyde kills half of Aedes aegypti mosquito larvae in 24 hours. Trans-cinnamaldehyde also works as a potent fumigant and practical repellant for adult mosquitos. Numerous derivatives of cinnamaldehyde are commercially useful. Dihydrocinnamyl alcohol, which occurs naturally but is produced by double hydrogenation of cinnamaldehyde, is used to confer the fragrances of hyacinth and lilac. Cinnamyl alcohol similarly occurs naturally and has the odor of lilac, but can be also produced starting from cinnamaldehyde. Dihydrocinnamaldehyde is produced by the selective hydrogenation of the alkene subunit. α-Amyl- and α-hexylcinnamaldehyde are important commercial fragrances, but they are not prepared from cinnamaldehyde. A number of derivatives of cinnamaldehyde have been found commercial application. The naturally occurrinbg dihydrocinnamyl alcohol, which is also produced synthetically by double hydrogenation of cinnamaldehyde, has been used to produce the fragrances associated with hyacinth and lilac. Cinnamyl alcohol, which also occurs naturally, has the odor of lilac, and can be produced from cinnamaldehyde. Though cinnamaldehyde is used in agriculture because of its low toxicity, it is a skin irritant in concentrated form. Thus, for preparations that may come into contact with the skin, dilution is imperative to avoid sensitizing skin tissues. Part of the essential oil extracted from cinnamon bark is pure eugenol (one study found approx. 5% of the essential oil in the bark of C. verum to be eugenol). Eugenol is an allyl chain-substituted guaiacol, and a member of the phenylpropanoids class of chemical compounds. Besides cinnamon, eugenol is found in nutmeg, cloves, basil and bay leaf. It is present in concentrations of 80–90% in oil extracted from the clove bud, and comprises 82–88% of the oil extracted from clove leaves. Using the agar well diffusion method, Singh et al. (2007) investigated the effects of eugenol on the growth of Gram-positive Bacillus cereus, B. subtilis, and Staphylococcus aureus, as well as on Gram-negative bacteria such as Escherichia coli, Salmonella typhi, and Pseudomonas aeruginosa. At 1,000 ppm, eugenol inhibited the growth of the bacteria and complete inhibition was obtained against P. aeruginosa at a high concentration of 2,000 ppm. This inhibition was high in comparison to ampicillin (1 mg/mL) used as a positive control. Cinnamomum verum, known as the “true cinnamon” or Ceylon cinnamon, is a small evergreen tree belonging to the family Lauraceae. It is native to Sri Lanka, in former times known as Ceylon. Today, though the species has been exported to numerous other sites worldwide, Sri Lanka still produces 80–90% of the world’s supply of Cinnamomum verum bark. Cinnamomum verum trees are 10–15 meters (33–49 feet) tall. The leaves are ovate-oblong in shape, 7–18 cm (2.75–7.1 inches) long. The flowers are arranged in panicles and have a greenish color and a distinct odor. The fruit, a purple drupe about 1 cm in diameter, contains a single seed. Essential oil is extracted from the bark, the flower buds, and the leaves, and the constituents of each of these oils differs substantially. With respect to C. verum bark, for example, though (E)-Cinnamaldehyde is always the main constituent, more than 70 other compounds — comprising monotetpenes, oxygenated monoterpenes, sesquiterpenes, phenyl propanoids and benzenoids — have been identified. The fractions represented by these compounds varies considerably with the locales where the C. verum was cultivated. Variyar and Bandyopadhyay analyzed C. verum bark oil from Kerala, south India and identified 12 components, of which (E)-Cinnamaldehyde (82.11%) and (E)-cinnamyl alcohol (7.69%) were the major compounds, while o-pinene, limonene, 1,8-cineole, linalool, terpinen-4-ol, coumarin, (E)-cinnamyl acetate, eugenol, B-caryophyllene and cr,-humulene were minor constituents. True cinnamon (derived from C. verum) poses no hazards to humans, even when taken internally in relatively large amounts. However, the high coumarin fraction found in C. cassia and in other species of Cinnamomum besides C. verum is so high as to recommend limiting the amount of herb permissible for culinary or medical purposes. On the other hand, when used as an external cleanser — either on skin or on inanimate surfaces — all species appear to be worthy of use, though prudence recommends that cleansers that may be, at times, used on skin the coumarin fraction should be minimized. When cinnamon is used for cleansing inanimate objects, however, there is no reason to believe coumarin is not a useful constituent, owing to its function as a protectant to the plants from which it is derived. Cinnamaldehyde, the most abundant molecule found in cinnamon bark, cleanses applied areas via a wide variety of means, including its ability to neutralize fungi and bacteria, and produce conditions that neither nurture nor attract pest organisms. Type Species: C. verum J. Presl (VEER-uhm) — from the Latin verus = genuine/true/real; a small evergreen tree native to Sri Lanka, formerly known as Ceylon; the species is, among the 300-plus species in the genus Cinnamomum, characterized by having a thin aromatic inner bark of unusual softness and easily crumbled by hand and efficiently ground into a fine powder with a spice grinder, while the bark of other members of this genus are of a hardness that requires special grinding equipment to reduce them to a powder. Jayaprakasha, G., et al. 2002. Chemical Composition of Volatile Oil from Cinnamomum zeylanicum Buds. Central Food Technological Research Institute, Mysore-570013, INDIA. Ranasinghe, Priyanga, et al. 2012. Effects of Cinnamomum zeylanicum (Ceylon cinnamon) on blood glucose and lipids in a diabetic and healthy rat model. Pharmacognosy Res. 2012 Apr-Jun; 4(2): 73–79.